A British company which was formed in a modest way for the manufacture of ticket punches and has since developed its activities to embrace all forms of ticket control systems, calculating machines and navigational and other equipment for ships and aircraft will, next month, celebrate its seventieth anniversary. The original Bell Punch Co., Limited, was incorporated on July 5, 1878, with an authorised capital of £30,000. It was established to acquire the patent rights of an American hand registering ticket punch which had already been adopted by a few tramway companies in this country, including the North Metropolitan Tramways, London Tramways, and companies operating in Glasgow, Liverpool, and a few other towns. Prior to the introduction of this system the general tariff system upon tramways involved either a universal fare or else the route was divided into zones with a flat fare charged and collected in each zone. The check was usually by means of tickets issued from a roll. The punch, used in conjunction with a series of varying priced preprinted tickets, enabled tickets to be issued for any length of journey, and for the first time made it possible for overlapping fare stages to be introduced, thus granting passengers full value in the form of distance to be travelled for the fair paid. In 1884, Mr. John Melton Black joined the board as managing director and soon afterwards began to develop a small rotary ticket printing machine designed to bring about very considerable economy in the printing of tickets. In 1889 the company was reconstructed with a nominal capital of £100,000 in order to provide capital for the building of these small rotaries, the acquisition of a suitable factory for this new ticket business together with the establishment of an engineering shop for the building of the company's machines and the manufacture of bell punches which had originally been imported from America. About this time Mr. J.M. Black improved the design of the punch and introduced what is known as the box or breast punch which gained rapid favour over the hand punch in that it left the conductor's hands free. A site was acquired from the Ecclesiastical Commissioners situated behind a row of cottages in Tabernacle Street, just north of Finsbury Square, in the City of London, and the building of a factory to the company's requirements was undertaken. Two of the little cottages in Tabernacle Street were used as offices. In 1891 the company succeeded in making arrangements with the London General Omnibus Co., Limited, for a trial of the new system over two or three of its bus routes provided that Bell Punch would itself operate the trial and provide all the necessary equipment and operating staff. Ticket racks were erected in part of the company's factory from which the trial was operated. It proved a great success and one route after another was added to the trial. Eventually L.G.O.C. took over the operation, entering into a contract to extend the system over the whole of its routes. It established its own ticket office in City Road in order to be within easy distance of the source of supply of tickets. It is interesting at this stage to note that from 1891 right up to the present day Bell Punch has supplied tickets to London buses without a single break, during which time the L.G.O.C. absorbed the London Road Car and the Vanguard businesses, later itself being absorbed by the London Underground group which, in due course, was embodied in the London Passenger Transport Board — now the London Transport Executive. In 1894 the company suffered a disastrous fire which started in a bedstead manufacturing concern — Angus and Company — some 40 yards down the street. The intervening premises were occupied by the furniture manufacturing firm of Lebus and Company. The fire spread rapidly and resulted in one of the largest fires in London during the last century — many acres of buildings in the neighbourhood were completely gutted with the company's recently-built factory in the middle of the area. Temporary premises were taken in Charterhouse Square where flat-bed printing presses and numbering machines were installed for the production of tickets, and the construction of new rotary machines was rapidly undertaken. The site of the gutted works was cleared as quickly as possible and plans prepared for the construction of an enlarged factory area of which could now embrace that formerly occupied by the row of cottages. The building was hurried forward, completed and occupied at the end of 1895. Rapid expansion of the company's business took place in the early 1900s when many of the company-owned tramways operating in the provinces were taken over by the municipalities under powers granted to them by Act of Parliament, and it was then that the extensive electrification of tramway systems in the country took place. In 1909 Mr. J.M. Black retired and his son, Mr. H. Drummond Black, who had already acted as secretary for some years, was appointed managing director in his stead. It had become obvious by 1912 that if the business was further to expand it would be necessary to seek additional accommodation. Three courses were open: the acquisition of an additional factory; a move into a larger factory, and the acquisition of a site in the country where the company could build to keep abreast of expanding requirements. Mr. Drummond Black favoured the third course since there was no real reason why the Bell Punch Company's activities should be conducted from premises in the centre of the City of London. War came in 1914 and Mr. Drummond Black took the opportunity quietly to search for a desirable country site. He found the site known as Upper Colham Mill at Uxbridge, then occupied by Bell and Croydon, who were using the old mill building and power from its undershot waterwheel for the medication of cotton fabric and the manufacture of field dressings. The directors were persuaded to acquire this property with possession six months after the termination of hostilities. Plans meanwhile were prepared and building started in 1919. The company was able to transfer to the country piecemeal in an orderly fashion, and the move was completed by 1922. We reproduce an up-to-date aerial photograph of the factory buildings in which the extensions mainly affected during the recent war are identifiable by there white asbestos roofs [photograph in the original]. In 1924 Bell Punch acquired Automaticket, Limited, a small organisation which had been formed for the purpose of importing from America ticket issuing machines primarily for use in cinema box offices, and this started the company's research and development of ticket issuing machines in all fields. It soon developed mechanisms of its own which, in the course of a short time, obviated the necessity of importing from America. Up to about 1930 there had been no company in this country involved in the manufacture of a taximeter and the trade was entirely dependent on meters imported from abroad. A small concern with little capital called the Waddington Tamperproof Taximeter Co., Limited, did start but made little headway. The manufacture of taximeters fitted in with the Bell Punch Company's scheme of cash control mechanisms and the concern was acquired with a resulting embarkation upon the manufacture of taximeters in reasonable quantities. Today it is the only manufacturer of taximeters in this country. As an adjunct to one of its ticket control systems the company required a small adding mechanism, and in the search for a tried mechanism instead of devising one of its own from scratch, it became acquainted with a small adding machine that was being developed by Petters, Limited, of Yeovil [see the Petometer adding machine, below]. It was not a difficult matter to acquire the rights in this mechanism from Petters and thus it was that that the company embarked upon the manufacture of a small adding machine to which it gave the name Plus. Some tens of thousands of the machines have been sold both at home and abroad. One of the early Bell Punch adding machines, the Plus Adder S decimal calculator which was derived from the Petters Petometer. Illustrated here, at an exhibition in 1952, is a later adding machine derivative fitted to a Bell Punch ticket control system. 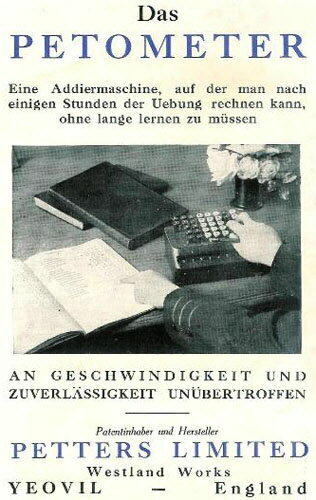 It was but a stage to enlarge upon the capacity of this adding machine in the development of a full keyboard calculating machine which was eventually developed over the few years before the recent war and, under the name Sumlock, it was launched upon the market in 1940. For the purpose of more efficient exploitation of the Plus and Sumlock machines London Computator, Limited, was incorporated to deal with the sales side of these activities. The Sumlock machine requires for its efficient operation trained operators, and schools for training of pupils were established in London and the provinces. 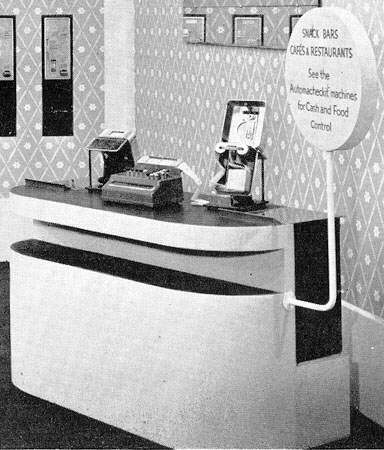 Automaticket already had a certain number of service stations for the repair and maintenance of ticket issuing machines and these were enlarged and added to for the purpose of providing branch offices, schools and service depots for the local maintenance of all mechanisms manufactured by the Bell Punch Company. The consumption of paper for conversion into tickets is obviously great since Bell Punch claims to be the largest ticket printer in the world and in order to avoid dependence upon outside supplies the company acquired its own paper mill — Isaac Warwick and Co., Limited, of Wraysbury, on the River Colne, near Staines. It was a mill that had been supplying the company with ticket middles since about 1896. In July, 1927, Control Systems, Limited, was incorporated, for the purpose of acquiring and consolidating the direction of the growing diverse activities of the Bell Punch Co., Limited, with an authorised capital originally of £300,000, later increased to £450,000 in November 1936. As designed, this company is purely a holding company and quotation on the Stock Exchange was sought, and granted, in 1936. The capital was subsequently increased to £600,000. The company's contribution in the provision of war equipment was important and, in collaboration with technicians from the Admiralty and the Royal Aircraft Establishment in Farnborough, it designed, developed and manufactured many highly technical instruments, the more important of which may be mentioned. There was the A.P.I. (Air Positioning Indicator), a mechanical navigating instrument first used by the Pathfinders and subsequently fitted to a large number of bomber aircraft. Other products included the torpedo director — an instrument which, for the first time, enabled torpedo-carrying aircraft to launch their missile when they were apparently taking avoiding action, and the Fall of Shot Indicator — used on warships for identifying fall of shot from particular guns. Naval equipment also included the Target Bearing Indicator and Pelorous Sighting Gear for the laying of guns on warships and the Corrector Compass Coil, applied to all ships for countering the effect of the degaussing gear fitted to ships for protection against magnetic mines. The design and development of all these high precision instruments were, in the main, accomplished by Mr. C.F. Webb, the company's chief designer, who was granted the M.B.E. in recognition of his services. 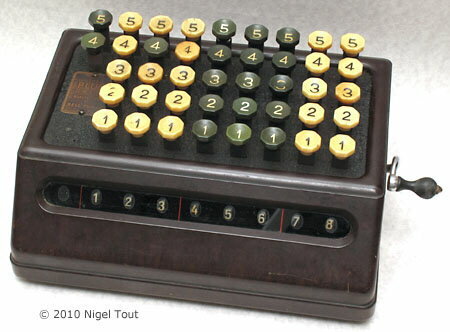 The design for the first Bell Punch calculators, the Plus Adders (see photograph above), was bought from Petters of Yeovil, Somerset, the well known manufacturers of oil engines and the company from which Westland Helicopters derived. The book "The Story of Petters Limited", by Percival Petter, written in 1933, gives the information that Guy Petter, of the Petter family, had been developing a calculator and in 1927 moved to the Petters Yeovil factory to work on it full time. Development of a satisfactory mechanism proved much more difficult than anticipated but by the time the history was written, in 1933, it was ready for manufacture under the name "Petometer". Some of these early Plus adders are described and pictured in the Mechanical Calculators section.